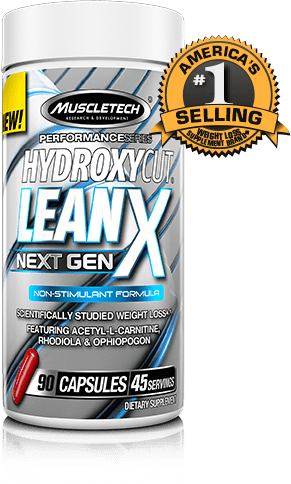 Order and automatically receive 40% Off Hydroxycut LeanX, 90 Capsules! For 20 years, the HYDROXYCUT® name has been synonymous with results. And now the next evolution is here: HYDROXYCUT® LEAN X NEXT GEN. The researchers at MuscleTech® have created a potent non-stimulant formula that harnesses the weight loss power of C. canephora robusta without overstimulation. * The science speaks for itself: subjects taking the key ingredient in HYDROXYCUT LEAN X NEXT GEN (green coffee extract [C. canephora robusta]) lost 10.95 lbs. in 60 days with a low-calorie diet, and 3.7 lbs. in an 8-week study with a calorie-reduced diet and moderate exercise. * Most weight loss formulas don’t have any scientific studies backing their key weight loss ingredients, let alone two. * HYDROXYCUT LEAN X NEXT GEN stacks seamlessly with other supplements and is suitable for all levels of fitness. The Weight Loss Plus Complex features traditional herbal ingredients including the adaptogen (Rhodiola rosea), as well as Ophiopogon japonicus and cayenne pepper to create a totally unique formula. An herbal extract supplying rosavins and salidrosides. An herb with long-standing traditional use. The seed of Anethum graveolens have been used traditionally for a long time. A unique mushroom with a long history of traditional use, containing compounds called hericenones. Patented BioPerine®, is derived from Piper nigrum, a black pepper extract. Each batch of new HYDROXYCUT® LEAN X NEXT GEN undergoes strict quality control and is third party tested. The verification ensures that each bottle of HYDROXYCUT LEAN X NEXT GEN upholds the highest standards of purity, quality and consistency.